Rare earth elements (REE) are among the Critical Raw Materials classified by the European Commission due to unbalanced supply and demand. Neodymium and praseodymium belong to the REE group that plays a significant role in NdFeB magnets, which are applied in green technology devices such as wind turbines and hybrid cars, besides hard disk drives. Recent data estimate that demand for these magnets will increase in the next years, causing insufficient metals availability. Recycling is an alternative to solve the problem, however there are many difficulties, mainly economics, since there is no profitable process developed yet. This study was mainly focused on the evaluation of neodymium and praseodymium leaching efficiency from post-consumer NdFeB magnets. Three factors (solid/liquid ratio, temperature, and time) were studied to evaluate the process. 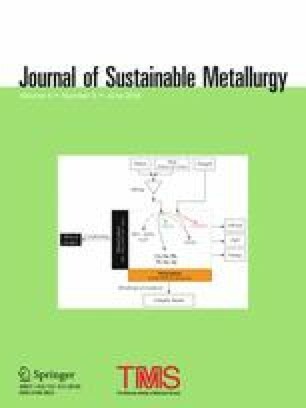 Statistical design of experiments and analysis of variance were performed in order to determine the main effects and interactions among the investigated factors for the leaching efficiency of neodymium and praseodymium in sulfuric acid 2 mol/L. The results showed that the highest leaching efficiencies for neodymium and praseodymium were 90.3 and 89.6%, respectively, and they were obtained at 1/20, 70 °C and 15 min. The ANOVA showed no significant factors for praseodymium. On the contrary, temperature and time were the significant main factors with positive effect, and the interaction between the three factors had a significant negative effect for neodymium. The authors are grateful to the Coordenação de Aperfeiçoamento de Pessoal de Nível Superior (CAPES) and the Conselho Nacional de Desenvolvimento Cientifico e Tecnológico (CNPq) for their financial support. Minitab Inc (2013) “Minitab” version 17.1.0. https://www.minitab.com/en-us/.